Us and expeditions? We go way back. You might think that selling fantastic brands of outdoor gear is our be all and end all, but no, you’d be wrong if you did. Many of the Irish expeditions of the last while have had our support, financially, technically or with sponsored gear and back up. See below for some of our biggest expeditions; the Revolution Cycle being one of the most recently achieved. We sponsored the CMRF Climb For Kids Kilimanjaro Challenge. 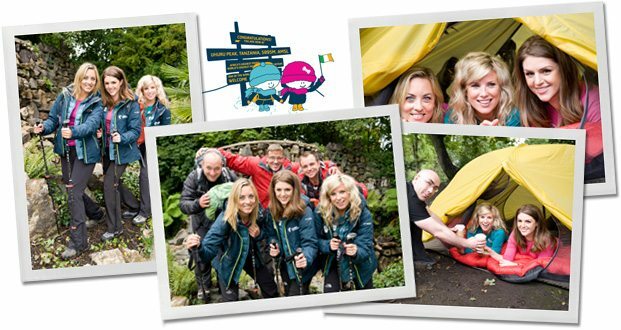 For the challenge itself, some well known Irish faces climbed Kilimanjaro to raise funds for the Crumlin Medical Research Foundation all kitted out in our gear. In November 2008, Simon Evans and Fearghal O’Nuallain began the first Irish circumnavigation of the globe by bicycle. Their unsupported expedition will cover over 30,000km, passing through 30 countries and some of the highest, lowest, driest, coldest, warmest and loneliest places on earth. In doing so, they will be promoting the positive contribution that cycling can make to mental health by encouraging people to get on their bikes, and by raising funds for Aware. Ferg and Si have been mates as far back as they can remember, and have been dreaming about going on a big adventure for almost as long. One rainy night in Dublin, three years ago, they made a pact to turn their dream into a reality. Over a few too many Guinness in The Stag’s Head they agreed to take a chance and attempt something that seemed almost impossible to two ordinary lads from Wicklow. Boldly, they decided to cycle around the world. The next three years were spent planning and training, poring over maps and reading expedition journals. Climbing mountains, cycling 1000km through the Egyptian desert, crawling through the freezing mud of the infamous Tough Guy Challenge and of course, spending many grueling miles in the saddle. Rowed the Sara G 5000 km across the Atlantic Ocean. Became the first blind person to walk to South Pole. Summit attempt aborted after tragedy. Expedition on river Zanskar in India which would be featured in the movie “Huck’d”. Hannah and her team come second. Attempt to have first Irishwoman summit the world’s highest mountain. Great Outdoors were the equipment sponsor and sourced other equipment needs for this expedition, which included Frank Nugent, Mike Barry and John Burke plus some other key people. Successfully became first Irishman to summit. During the months of September and October 1987, the first Irish Expedition to Tibet and the Everest region attempted Zhangzi (7,580 metres). Zhangzi, pronounced “Chang-tse’ is the North peak of Everest which connects with Everest’s North Col (Chang La). Great Outdoors sponsored this whole expedition.